How do we kill this car? 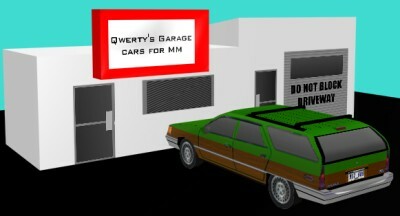 I've quit making cars for MM1 (and Carma 2). You're gonna have to search hard to find my cars. I have a list of MM1 cars and list of Carma 2 cars to browse through. There are links to where you can download them on the pages. Alternate links to MM1 Tutorials are located here. My latest "obsession" is probably web development. I know, this site looks like crap, but I want to keep it basic. It's not like anyone visits it that often anyways. But I am saving my skills for a website about the Ford Taurus/Mercury Sable. It's an encyclopedia with all sort of information about it. Why am I plugging it here? Because I want it to show up on search engines and search engines look at relative links on different websites to add things to the top of the list. And I also want a lot of people to see it. So, go visit it. Visit the Taurus Car Club of America. They know everything about the Ford Taurus and Mercury Sable. I highly recommend them if you've got problems with one of those cars. Sign up for the forums and they can help ya.